Public libraries throughout the state are currently knee-deep in summer reading programs and outreach efforts. This is usually the busiest time of year for them as they work to help students maintain the reading gains made during the school year while providing fun activities that draw kids of all ages into the library during their summer vacation. The Idaho Commission for Libraries (ICfL) has worked with public and some school libraries for over 40 years to provide resources and support to strengthen summer programs and reach more children who may have barriers in participating. Working closely with Boise State University Literacy Professor Dr. Roger Stewart, staff at the ICfL launched a pilot program last year to keep six elementary schools open over the summer and provided K-2 students in three of those schools with six paperback books the students selected themselves during the last weeks of school. These research-based strategies come from Richard Allington and Anne McGill-Franzen’s Summer Reading: Closing the Rich/Poor Reading Achievement Gap, a book that has been widely shared in trainings for public and school librarians. Allington asserts that summer reading loss accounts for roughly 80 percent of the rich/poor reading achievement gap, yet far too little attention is given to this pressing problem. While Idaho Reading Indicator scores didn’t budge during the first year of the ICfL’s Summer Slide pilot program, new strategies and efforts in Year 2 of the program are in place and staff members are optimistic that more students will minimize their summer slide this year. Participating schools are Horizon Elementary in Jerome, Mountain View Elementary in Burley, Desert Sage Elementary in the West Ada School District, Wilson Elementary in Caldwell, and Fernan Elementary in Coeur d’Alene. Focus groups with parents and work done in past years to increase participation found that many parents do not understand how crucial it is for children to spend time outside of the school day reading. Radio public service announcements in English and Spanish began airing statewide in April and will run through June to help convey the importance of out of school reading time. (You can listen to the 30-second ads at http://libraries.idaho.gov/page/summer-reading-resources.) Students who only read in school will rarely be great readers. The time spent in school is usually enough time to learn to read, but not nearly enough time for most kids to become proficient at reading. “The radio ads are short, but the more times and different ways parents hear this message the more likely they are to act on it,” Shaw said. Another strategy libraries are using to reach children who may struggle with reading or have barriers getting to a library is to “follow the food.” Idaho had 321 Summer Nutrition Feeding Sites in 2014 and the ultimate goal is to provide books and learning enrichment activities from the library at as many of these sites as possible. ICfL and library staff from Ada Community Library and Boise and Garden City Public Libraries are in their third year of hosting “Literacy in the Park” programs in partnership with the Idaho Foodbank’s Picnic in the Park program. Each of the 26 parks and low-income housing sites served through the Foodbank’s lunch program get a weekly visit from library staff who bring bins of paperback books for the kids along with fun science and other learning activities. Over 12,000 children of all ages participated in Literacy in the Park last summer and surveys conducted the last two weeks of the program showed participating children enjoyed the books they borrowed and 75 percent said they read more that summer than past summers. One-third of parents surveyed during the last two weeks of the program attributed the increase in reading to Literacy in the Park efforts. 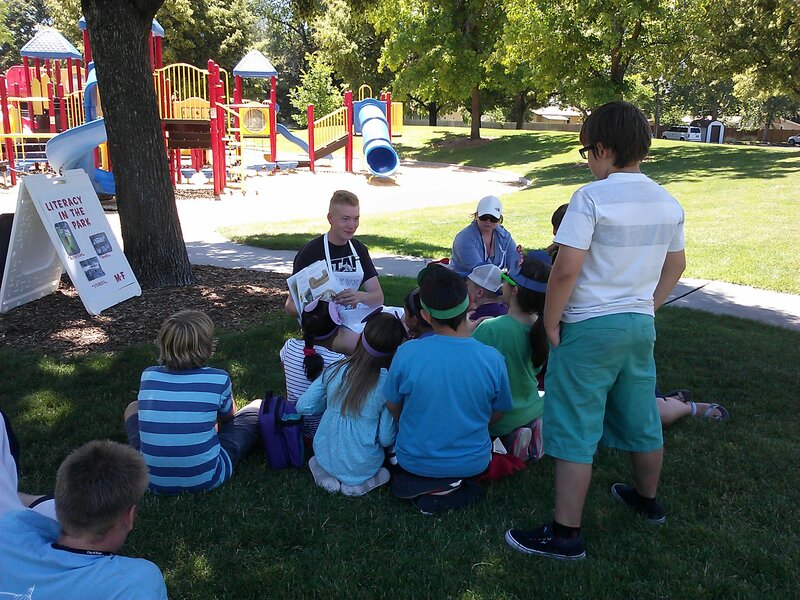 ICfL VISTA Volunteer Levi Orr reads to children during last year’s Literacy in the Park program. A third of the public libraries in the state are planning similar outreach efforts this summer at feeding sites along with visits to daycares, migrant and seasonal Head Start programs and summer school programs. ICfL is providing over 10,000 paperback books for public libraries to use in these efforts. “Libraries are working with schools and as many partners as possible to reach youth who wouldn’t normally participate in summer reading programs. We are excited about how these partnerships are shaping up and the efforts being made to ensure fewer kids will arrive at school in the fall who are behind their peers who have had access to books,” Shaw said. ICfL staff can share more information about Idaho’s efforts to combat the summer slide at library board meetings and/or by providing copies of Summer Reading: Closing the Rich/Poor Reading Achievement Gap for library staff or trustees. Contact Stephanie Bailey-White, Stephanie.bailey-white@libraries.idaho.gov for more information about getting a book or scheduling a brief presentation. Stephanie Bailey-White has been with the Idaho Commission for Libraries for 23 years and helped launch the Read to Me Program in 1997 to advance early literacy statewide. She has a Master’s Degree in Reading Education and loves seeing Read to Me programs in action across the state. Great comics created at an excellent presentation at ILA Region 2!